I wouldn’t have started listening to country music if it weren’t for Emmylou Harris. Wrecking Ball was my gateway drug, and I wanted more. Even though I loved Harris, I was wary about how to approach this newfound appreciation for a genre that speaks nothing at all to my experience. You can’t get any whiter than country music. Luckily, Harris’ former label Warner Bros. made that exploration easier by releasing a three-CD, career-spanning boxed set titled Portraits. I determined Pieces of the Sky would be my next purchase, followed by Bluebird. 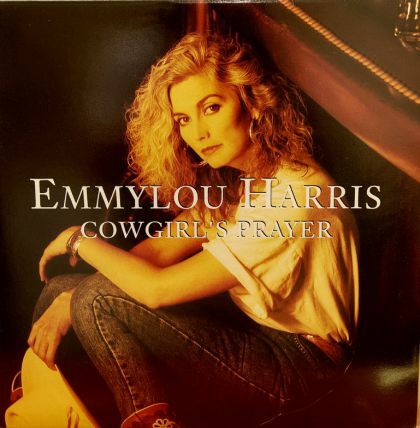 The boxed set left out Cowgirl’s Prayer, the first album Harris recorded for her then-new label Asylum before following up with Wrecking Ball. With so many great albums under her belt, surely Cowgirl’s Prayer would be a safe investment. So I bought it, and while I could recognize it wasn’t bad, I wasn’t swayed enough to call it good. At the same time, I knew I didn’t have enough context. Harris had released a dozen and a half albums by the time I encountered her, and I had only five points of data up till then. Cowgirl’s Prayer, unfortunately, did not survive the next crush for cash, and I sold it. But not without backing it up on a CD-R of MP3s. Since falling down the black hole of vinyl collecting in 2013, I’ve made sure my analog acquisitions have digital counterparts, which meant my Emmylou Harris collection expanded greatly over the last two years. I revisited Cowgirl’s Prayer for the first time in 14 years, and my more mature ears — educated extensively in Harris’ oeuvre — finally understood that context. As stated by other writers many times over, Harris doesn’t really record bad albums. Cowgirl’s Prayer isn’t Pieces of the Sky, Trio, or Luxury Liner, but it’s not Ballad of Sally Rose, or Hard Bargain either. If Harris’ albums were ranked, Cowgirl’s Prayer would inhabit the upper half of that list. She sounds reinvigorated after a lackluster turn on Brand New Dance. The eclectic song choice and pristine production could have been a product of her early days with producer Brian Ahern, while the sparser arrangements hinted at the introspective direction her music would go. What I didn’t understand about Cowgirl’s Prayer was the fact it was a pivot. It was the last album Harris would record aimed at a mainstream country audience, but it set the template for Wrecking Ball and everything that came after. An unlikely comparison would be Sade’s Love Deluxe. I thought the album was a dud because I wanted more of Stronger Than Pride. I didn’t realize Love Deluxe was the starting point for Lovers Rock and Soldier of Love. Of course, it took Sade eight years to clarify that point. Wrecking Ball is definitely the album on which Harris transformed her career, but before it could happen, Cowgirl’s Prayer needed to set up the shift.